3:30 am and the full (10) table is very active. Tilted play caroms around from one to another player. 6 way L to me in SB A♦K♦ ($315). I call. I can defend this if you want to hear it but I will do this in crazy games. BB raises to 10?! ($190) ONLY 3 players call and it’s back to me. I raise to 100. MP is the only caller and he gets it in pretty quick. He’s a regular that wins and he thinks he knows my game but … usually he gets to see me short stacking with $100 and I shove more than call. He has 155 (255-100) behind. I feel more or less committed even before the flop. Flop (250) 9♦4♥2♣ – I push. He snap calls w/64o. WTF? How does he expect to profit from his call PF? Even if he had a 100% tell on me he can’t turn a profit here, can he? Let’s say my hand is face up after his PF call and I push blind. I still think this is -EV for him. He could fold all Ax and Kx flops but he’s calling everything else. I do not want to get into the strategy of this line. I will let the folks over on the forums do that. What I do want to do is look at the specific math question (in bold) with Flopzilla. The question is a little off since an omniscient Villain that knew our cards should only call when he makes a pair and it is ahead. When does that happen? We have put the Villain’s range in as 64o and our hand in as AdKd. 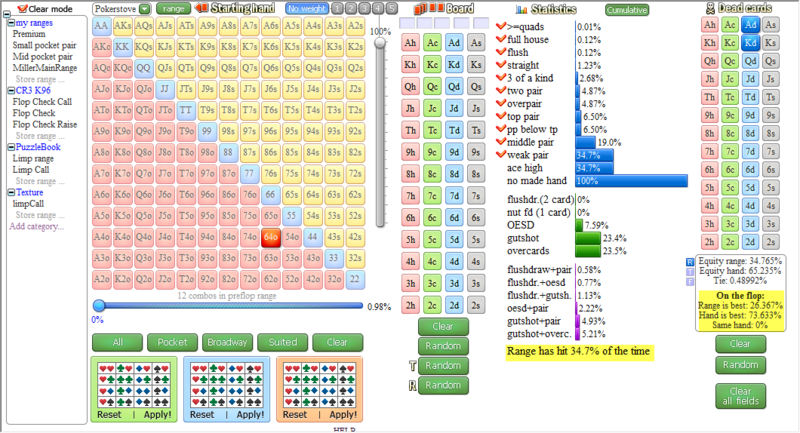 The important result is in the lower right: Villain is best 26.367% of the time on the flop. There is a second number worthy of note: Villain hits a pair or better 34.7% of the time. This means there are times in that 34.7% of the time where Villain hits a pair and is still behind. We are assuming we lay our cards out after we bet, so Villain can do the perfect thing. The pot going to the flop was $250 and there is $150 left. When he is behind on the flop, lets assume he folds. 75% we win about $190, this is $140 on average. When he is ahead on the flop, lets assume he calls. He could have two pair, he could have a straight, but overwhelmingly he will have a single pair and we will have six out with two cards to come. We can not easily say what our equity is when called. Let’s find a lower and upper limit. Lower limit: When he is ahead, we burn our cards in frustration. 25% of the time we lose $150. Upper limit: When he is ahead, he only has a pair, and we have six outs twice or 24% equity. We will call it 25%. The final pot is $550, so we are entitled to about $140 even when called for a loss of $10. This means overall we will make between $190 and $190+$140 or $330. Next we need to weigh this by the probabilities. This line profits us between $100 and $138 when we blind shove the flop for $150. What happens from Villain’s perspective on the flop? 75% he folds for neutral. 25% he is ahead and calls. He still sometimes loses to our six outer so only gets 75% of the final pot of %550 or about $410. A profit of $260 or $65 on average. An omniscient Villain can claim his equity very well on the flop and does find the flop call profitable. The question though is how did he get to this spot? Villain spent $90 on a ticket to the flop where he will on average recover $65 with perfect omniscience. This was a losing move pre-flop, but he recovers a bit on the flop. We have forgotten one really important thing here, Villain is not omniscient. Remember he hits a pair or better on the flop 35% of the time, but is only ahead 25% of the time? This 10% gap where the omniscient player folds a pair is called reverse implied odds for everyone else. If Villain were to call there, he would usually have five outs twice or 20% equity in a $550 pot, or $110 for an average loss of $40 on his $150 call. This loss happens when he can not fold a ratty pair on a flop with an Ace or a King. This loss happen about 10% of flops, so that is about $4 he loses on average. This knocks his $65 win on the flop down to about $60. Villain’s pre-flop call of $90 is costing him about $30 each time he makes it. Do not focus on cases like this where he recovers his equity. Instead think of the wildly more numerous situations where he calls pre-flop and you quickly pick up $90. Thanks for that. Not to make light of it but it’s close to the ‘feel’ I had for the situation. Add in that V is up against a range here that includes some hands that smoke him and it’s worse than the specific example for him.